Breakfast is widely regarded as the most important meal of the day, but in our fast-paced society we often neglect our own needs in the morning as we rush to get the children ready for school, walk the dog, and strive to beat rush-hour traffic. SALT @ The Glass Factory is a new café and restaurant on Galway’s east side. Located on the Old Dublin Road, above the Galway Crystal Factory Store, SALT is open seven days a week, serving breakfast, lunch, and lots of tasty home-baked cakes and pastries. 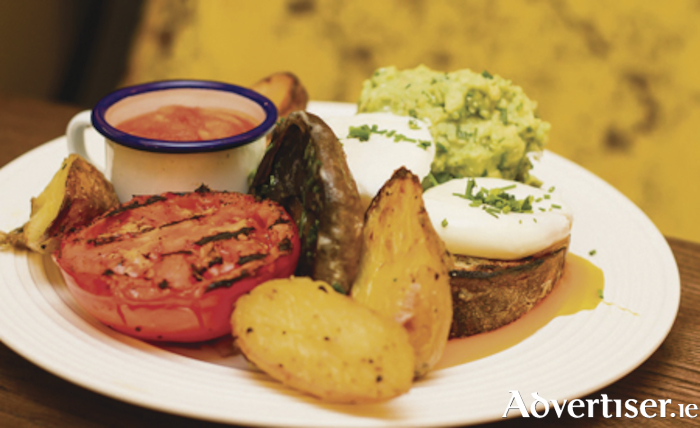 SALT serves breakfast from 8.30am to 11.45am from Monday to Friday, as well as from 10am to 11.45am on Saturdays. Whether it is a full Irish you are after, or you just fancy some poached eggs on toasted sourdough, SALT @ The Glass Factory is well worth a visit. The vegetarian breakfast (smashed avocado, poached eggs on toasted sourdough, a potato Danish, beans, and grilled mushroom and tomato ) is proving particularly popular this month. And of course, there is always the option to add some meat to the plate. In addition to the traditional breakfast dishes and omelettes, SALT serves freshly baked scones and savoury pastries daily, as well as a variety of lighter dishes such as granola with natural yoghurt, raspberry compote and seasonal fruits, or crème fraiche with fresh berries. Lunch runs Monday to Sunday from 12 noon to 4pm, with a wide selection of hot and cold dishes and, for those with a sweet tooth, there are lots and lots of tasty homemade treats from which to choose. If time is not on your side, a pre-order service is available and SALT @ The Glass Factory also takes group bookings for breakfast and lunch, with a discount available on groups of 10 or more people. SALT @ The Glass Factory is open Monday to Friday from 8.30am to 5.30pm, Saturday 10am to 5pm, and Sunday 12 noon to 5pm. For bookings, call 091 757 315.